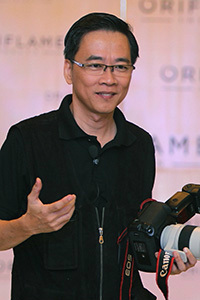 Teoh Peng Kee has more than 18 years experience promoting the EOS system for Canon Malaysia and Canon SSEA regional office. He was also selected as the EOS Master Canon Asia Pacific and as a speaker for the National and South South East Asia and India continent EOS Pro Seminar. With more than 20 years experience in photography and with Canon cameras, he is known as the "Walking Dictionary" for the EOS system among the photography community and camera industry. Teoh often shares his knowledge and experience at various workshops and seminars, and is well known among the photographic communities such as clubs and societies, press and wedding.